Yet a couple of weeks ago I found myself pushing my Good Shepherd aside. I wanted to accomplish things around the house; I wanted to escape my current reality with TV, books, magazines; I wanted to just keep moving. Because in the constant motion, I could forget what was going on around me. I could escape. But God in His infinite grace had another plan. 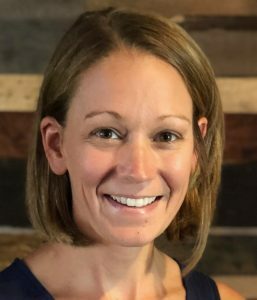 I found myself in excruciating pain several days in a row – perhaps the longest bout of pain I’ve had in weeks. I don’t believe that God wanted to see me in pain, but I do believe that He allowed it so that He could usher me into His presence in a very unique and sweet way. One of the most frustrating things with PHN and any chronic pain, is that your pain is not visible to anyone else. You may be struggling with debilitating pain at times, but yet you look normal. At first, I would get so frustrated with this concept, but then I quickly learned that so many of us have pain that no one else can see. We may be breaking on the inside but on the outside we look normal. And yet, in the morning as I lie in bed, I heard my Good Shepherd’s promise that I was not invisible – my pain was not invisible to Him. As I lie there, I filled my head with the song “Cast My Cares” by Tim Timmons. (If you haven’t ever heard it, I strongly suggest watching this video. – you’ll find yourself singing it to your heart over and over again). By God’s grace, my pain decreased within a few hours and I was able to go get a much needed Birthday pedicure with my dear friend. As I was driving, I realized that though the morning was painful, I would not change it. I would wake up and do it all over again. I saw a glimpse of God’s love for me. It was only a glimpse but it was so sweet and so wonderful that I’d do it all over again. Just a glimpse of His love is overwhelming and ultimately fulfilling – it’s this love that drives me to press in to Him in the midst of painful circumstances. For over a year now my body has been inundated with pain and feels like it is no longer my own. As I seek to understand this neuralgia that wreaks its havoc on me, I have found very little information and very few people who know, let alone understand, what I am experiencing. I have spent at least a year longing to be similar to those around me or at least wanting someone who understands me. But in those dark moments in my bedroom I realized that I only need One person to see me – One person to love me. In Matthew 11:28-29, Christ gives the invitation to come to Him burdened, weary, and wounded and in exchange we get to be yoked with Him and learn from Him. That’s a pretty grand invitation that I think we take for granted. 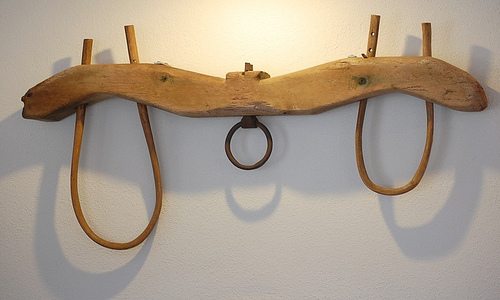 Above is a picture of a yoke used traditionally for oxen. 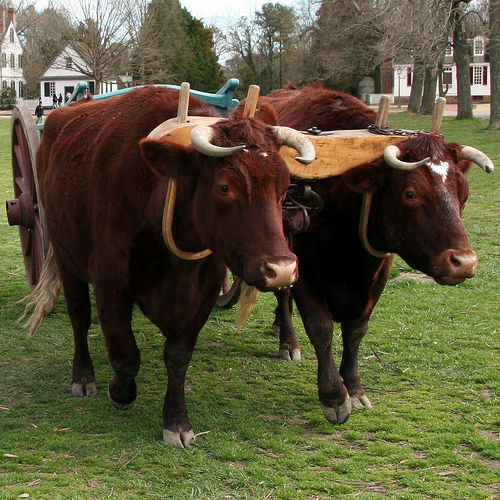 Two oxen of equal size and power are yoked together to harness their energy. When they are yoked together, they are forced to walk side by side and work together to carry a load. But when Christ invites us to be yoked with Him, we have an unequal yoking. We get to be yoked with the Almighty God who is perfect, all powerful, all knowing. He doesn’t need to harness our energy – He has enough for us. When we are yoked with Christ, we can rest, because we are walking side by side with our Heavenly Father who carries our burdens by Himself. He doesn’t need us to be yoked to Him, He just loves us so much that He wants to spend time with us and free us from those things that burden us. When we accept Christ into our hearts, He promises to carry our burdens for us. We were never designed to carry our own burdens. As I have mentioned several times in previous posts, we were designed to be dependent creatures, relying solely on our Creator. As we are dependent on Christ, He promises us a full life – not a life where we are barely surviving. He wants us to lay our burdens at His feet and enjoy the life He has laid out for us. This promise doesn’t mean that we will be without our share of Earthly struggles. Unfortunately Christ often warned us of the trouble that we would experience here on Earth. Jesus knew that because of sin in this fallen world we would have struggles that make us weary and worn but as Christians, we have the total comfort of knowing that we don’t have to bear the responsibility for our burdens. We know that we have a God who is greater than our struggles and as we lay them at His feet, we can REST knowing that He can be trusted. But I think that so often it takes a dying to ourselves to allow our hearts to entrust our burdens to Him. We have to die to our own pride that says that we know what is best for our lives – that we must be the ones in control. Sometimes as Christians we want to follow Christ AND have life go the way WE think it should. But the older I get, I have learned that that kind of living does not yield life. I have learned to be thankful that I am NOT the one in control. As I write this I am sitting in a hotel lobby in Rochester, MN. My husband and I came here to Mayo Clinic with a hope that maybe someone here has some other idea of how to treat my neuralgia. So far, we have heard nothing new and at times I’ve wondered if this trip was even worth the 9 hour drive and all the time and coordination it took to line up childcare for a week. But last night we went to dinner and sat outside because our waiter convinced us that the rain would wait until 9 pm. About 15 min later, we witnessed a torrential downpour while sitting at our table under the awning of the building. As I looked at the rain, I sensed that it was a reminder of God’s outpouring of grace in my life. Just as the rain overwhelmed the whole outdoor patio, so His grace will overwhelm my heart as I yield to Him and surrender. I don’t know what the rest of this week will look like, nor do I know if there will be any change in my physical health as a result of this visit. But I do know that my heart can find rest even in the midst of the unknown. I can cast my cares on Him, knowing that He loves me and is BIG enough to carry ALL my burdens. I pray that you too can enjoy REST as you transfer your burdens to Him knowing that He alone loves you unconditionally. Again, you brought me to tears. How I love and appreciate the way the Lord is working in and through you, Sue! The song, the visual image of being yoked, the cry of a genuine heart both in pain and full of hope and gratitude. I’m so proud to call you my friend. I’m praying for you! Please also pray for me. Love you!